Sponsored by: Arizona Oil and Gas, Inc.
Abstract: The Morenci porphyry copper-molybdenum deposit is located in southeastern Arizona approximately 260 km east of Phoenix. The Morenci mine consists of four active open pits, one concentrator, and four SX/EX plants that produced 631 million pounds of copper in 2012. Mining operations commenced in 1872 and were centered on underground mining of high-grade oxide mineralization hosted within Paleozoic sedimentary rocks. Underground mining then focused on high-grade chalcocite within enriched veins and stockwork masses along dikes in Laramide intrusions. Underground mining ceased in 1932 and open pit mining commenced shortly thereafter. Production amounts are incomplete prior to 1937, but since then approximately 1.4 billion metric tons of concentrator ore averaging 0.70% Cu and 6.1 billion metric tons of crushed leach and run-of-mine leach materials grading 0.26% Cu have produced about 32.5 billion pounds of copper. Proven and probable reserves for Morenci as of December 31, 2012 were 685 million metric tons of mill ore averaging 0.50% Cu and 0.021% Mo, 422 million metric tons of crushed leach ore grading 0.52% Cu, and 2,911 million metric tons of run-of-mine leach material with an average grade of 0.18% Cu. Year-end 2012 mineralized material amounted to 596 million metric tons of mill material grading 0.35% Cu and 0.020% Mo, and 2,278 million metric tons of leaching material averaging 0.21% copper. A new concentrator is currently under construction that will increase mill ore production from 50K metric tons per day to approximately 115K metric tons of ore per day. The Morenci district lies at the juncture of three important geologic provinces: the Basin and Range, Transition Zone with the Colorado Plateau-Basin and Range, and the Mogollon-Datil volcanic field. Geologic attributes of these provinces are recognized in the Morenci district. Proterozoic granitoid stocks are overlain by a 250 – 300 m sequence of Paleozoic clastic and carbonate rocks consisting of the Cambrian Bolsa and Abrigo Formations, El Paso Limestone (Ordovician), Martin Formation of Devonian age, and the Mississippian Escabrosa Limestone. A Cretaceous sandstone and shale (Pinkard Formation) disconformably overlies the Escabrosa Limestone. Emplaced within these rocks are Eocene hypabyssal intrusions consisting of stocks, laccoliths, and associated dikes and sills that constitute a comagmatic, calc-alkaline series of porphyritic intrusions. The intrusive complex was followed by block faulting and erosion that persisted to the middle Tertiary. Renewed magmatism associated with the onset of Basin and Range tectonics resulted in a series of basaltic to rhyolite volcanic episodes that buried the Morenci area. Volcanism commenced in the early Oligocene and persisted to the early Miocene. From about the middle Miocene, erosion of the Morenci area formed the thick sections of basin fill deposits of the Gila Group. The Eocene intrusions can be separated into at least six texturally and mineralogically distinct phases that range in composition from early diorite followed by quartz monzonite, monzonite, and quartz monzodiorite. The earliest Tertiary intrusive activity is a weakly mineralized diorite porphyry found as small plugs and sills in the southern area of the district. Large stocks of monzonite dated at 55 Ma, and quartz monzodiorite (age of 55 Ma) are associated with hydrothermal processes that formed the porphyry Cu-Mo deposits and calcic skarn in Paleozoic rocks. The monzonite porphyry occurs as a NE-trending elongate stock centered on the Morenci pit has prominent dikes along its margin. Intruding the monzonite is a quartz monzodioritic rock consisting of several irregular stocks and NNE-trending dikes that occur north of the monzonite. Several breccia bodies are associated with the quartz monzodioritic porphyry, none of which controlled ore-grade hypogene mineralization. Diabase and sub-ophitic gabbro occur as irregular dikes that were intruded along major east-striking faults and as sills within Proterozoic rocks. The diabase dikes intruded monzonite in the Morenci pit, and in turn are cut by quartz monzodioritic stocks and dikes. Situated north of the quartz monzodiorite is a quartz monzonite plug and sill complex. The quartz monzonite has an age of 55 Ma and formed localized skarn in Paleozoic carbonate rocks and contains sparse sericitic veins. The youngest intrusion is a post-hypogene quartz monzonite plug dated at 54 Ma that was emplaced within the older quartz monzodiorite stock. The younger plug truncated K-silicate and sericitic veinlets in the older stock, and is characterized by weak pervasive argillic and sericitic alteration. The earliest faults in the district are easterly-trending, pre-hypogene in age, and are crosscut by northeasterly-trending faults. The monzonite and quartz monzodioritic stocks are elongated northeast and associated dikes and sericitic veins are oriented along this northeasterly trend. Northwest-trending faults present in the southwest area of the district displace the northeast-striking faults, Eocene stocks and hypogene veins. Faults with northerly strikes displace the northwest faults, northeasterly-oriented faults and dikes, and the Oligocene volcanics in the northern part of the district. In the southern area of the district, a major northerly trending fault truncates the northwest-trending faults, and juxtaposed Neogene sedimentary rocks against Paleozoic and Mesozoic sedimentary rocks. Crosscutting hypogene veinlet relationships indicate that temporal variations of intrusive-hosted hydrothermal assemblages are identical district-wide. Earliest veinlets consist of quartz that has sharp veinlet walls with no selvages are found in the apical part of the stocks. These veinlets are closely followed by quartz veinlets with K-feldspar ± sulfide (cpy, py) ± biotite selvages. In mafic igneous rocks, pervasive biotite replacement of the rock is found between quartz ± K-feldspar ± sulfide veinlets. These are in turn crosscut by quartz ± molybdenite veinlets. These early veinlets are spatially restricted to the medial and deeper parts of the host intrusion and exhibit variable veinlet orientations. Some of these veinlets have an outer sericitic envelope that is interpreted as transitional from K-silicate to sericitic alteration. Multiple generations of quartz ± sericite ± pyrite ± chalcopyrite ± magnetite veins overprint the K-silicate veins. The sericitic veinlets are associated with intense wallrock alteration, have variable orientations, and are found throughout the district. Large, through-going quartz-sulfide fissure veins traverse the sericitic stockwork veinlets and are the latest expression of hydrothermal mineralization. In addition, calcic alteration that manifests as actinolite ± epidote veinlets and replacement of feldspars occurs along the outer margin of an oreshell hosted within a Proterozoic diorite stock. Deep drilling beneath K-silicate alteration zones has encountered greisen veins consisting of coarse-grained muscovite and quartz. Propylitic alteration is not well developed in the district, but localized areas with specularite and weak chlorite in Proterozoic granite are found outside the sericitic alteration. Hypogene protore throughout the district averages 0.2 to 0.4% Cu as chalcopyrite and 2-3 wt % pyrite in K-silicate veinlets that form oreshells localized along the monzonite and quartz monzodiorite stock margins. Mo with grades of 0.01 – 0.03% is found inward and overlaps the lower and center part of the Cu oreshells. District-wide sericitic zones average 0.1 to 0.2% Cu as chalcopyrite in veinlets and halos associated with 4-7 wt % pyrite. Highest grades occur in sheeted dikes proximal to the large stocks. The vast majority of ore mined from the district and carried in reserves is the product of supergene processes. The supergene profile consists of a surface zone of leached capping with copper grades of 0.03 to 0.05% characterized by hematite found above chalcocite mineralization with goethite and jarosite present along the fringes. Situated within and proximal to leached capping is an oxide copper zone consisting mostly of chrysocolla, malachite, and brochantite veins with Cu grades of 0.15 to 0.40% in intrusions and manto bodies that were very high-grade (>20%) in skarn. Beneath the oxide zone is a zone of partial leaching of chalcocite that consists of iron oxide, Cu and Fe sulfate minerals coating and replacing chalcocite that is situated atop the chalcocite enrichment deposits. Comprising the enriched zone is chalcocite ± digenite ± covellite mineralization that forms a laterally-extensive blanket 15 to 450 meters thick over an area measuring 11.4 by 8.7 km. Enriched copper grades range from 0.15 to 0.3% for ROM leach material, but crushed leach and concentrator ore have grades of 0.4 to 0.9% Cu. Copper grades of chalcocite mined underground were extraordinarily high and ranged from 2 to 10%. A zone of lesser sulfide enrichment that is beneath the chalcocite-dominant blanket and is transitional to hypogene mineralization consists of variable amounts of chalcocite, digenite and covellite that partially replaced chalcopyrite. The available geologic observations and geochronologic data indicate that leaching and enrichment initially occurred prior to Oligocene volcanism as demonstrated by leached capping and chalcocite mineralization situated beneath volcanic flows. Basin and Range faulting commenced in early to mid-Miocene time in southeastern Arizona with the development of high-angle faults that presumably lowered the base level and exposed the older supergene profiles and hypogene mineralization to a new cycle of leaching, oxidation and enrichment. This later cycle of leaching and enrichment has yielded 40Ar/39Ar dates for supergene alunite that range from 13 to 2 Ma. Bio: Ralph is currently vice president for mine site exploration with Freeport-McMoRan based in Oro Valley. He has exploration and resource block modeling responsibility for mines and inactive properties in North and South America and the Democratic Republic of the Congo. Prior to this he was chief geologist at Morenci and Tyrone, and attained those positions by working as a project and senior geologist at Morenci. Before, Ralph worked at the Questa porphyry Mo deposit in New Mexico and this was preceded with project and reconnaissance duties with several companies focused on sed- and volcanic-hosted precious metal projects in Nevada and Utah. His MS thesis was under Dr. Tommy Thompson at Colorado State University on the carbonate-hosted manto deposits at Aspen, Colorado and prior worked for Noranda as a mine geologist at Park City and on exploration projects in Colorado and Utah. 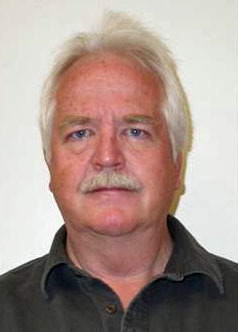 He started work as a geologist with the Utah Geological Survey working on mapping projects with Hellmut Doelling.